We work across many manufacturing sectors and industries, and whether a plant is producing onion bhajis or supplying into Aerospace the same basic thinking and process model applies. 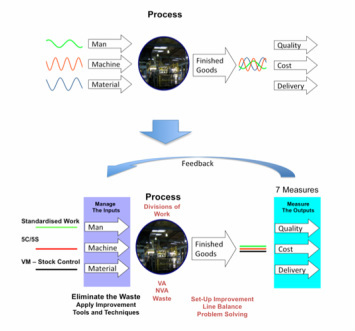 A process is simply the combination and interaction of the inputs which tend to be variable and will produce variation in the outputs, impacting on the Quality, Cost, and Delivery of the finished parts. Understanding your process in this simple manner provides the clarity for improvement activities, and allows everyone to become involved in process of improvement. By breaking down the process into the divisions of work (Value Adding, Non Value Adding, and Wasteful activities), and getting everyone to understand what really adds the value then we can begin to make sustainable productivity improvements by eliminating waste. As we move forward we show in simple terms how the best practice tools and techniques initially stabilise and then continuously improve your process. 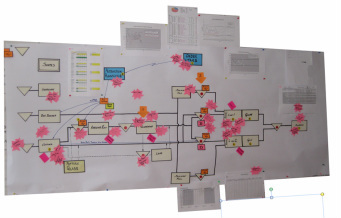 One of many ways to map a process.